Histone chaperone that facilitates histone deposition and histone exchange and removal during nucleosome assembly and disassembly (1). Cooperates with chromatin assembly factor 1 (CAF-1) to promote replication-dependent chromatin assembly and with HIRA to promote replication-independent chromatin assembly (2, 3). Interacts with histone H3 (including both histone H3.1 and H3.3) and histone H4. Recombinant Asf1a was produced in E. coli as a N-terminal GST fusion, purified using FPLC and formulated in a storage buffer containing 20 mM Tris pH 7.65, 150 mM NaCl, 1 mM DTT, 10% glycerol. Protein concentration was determined by spectrometry. >95% purity by SDS-PAGE. Each lot has been evaluated by 12% Tris Glycine SDS-PAGE. 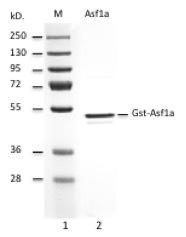 SDS-PAGE gel of recombinant human Gst-Asf1a (Lane 2). Lane 1, protein molecular weight marker. 1- Munakata T., Adachi N., Yokoyama N., Kuzuhara T., Horikoshi M.A human homologue of yeast anti-silencing factor has histone chaperone activity. 2- Mousson F., Lautrette A., Thuret J.-Y., Agez M., Courbeyrette R., Amigues B., Becker E., Neumann J.-M., Guerois R., Mann C., Ochsenbein F. Structural basis for the interaction of Asf1 with histone H3 and its functional implications. Proc. Natl. Acad. Sci. U.S.A. 102:5975-5980(2005). 3- Structure of a human ASF1a-HIRA complex and insights into specificity of histone chaperone complex assembly. Tang Y., Poustovoitov M.V., Zhao K., Garfinkel M., Canutescu A., Dunbrack R., Adams P.D., Marmorstein R. Structure of a human ASF1a-HIRA complex and insights into specificity of histone chaperone complex assembly. Nat. Struct. Mol. Biol. 13:921-929(2006).